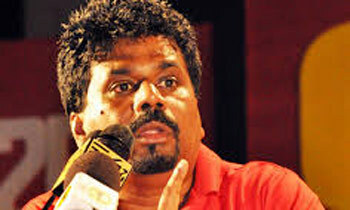 The Janatha Vimukthi Peramuna (JVP) said today that it had got a golden opportunity to seize power due to the political vacuum created in the country with the deterioration of the three main political camps of President Maithripala Sirisena, Prime Minister Ranil Wickremesinghe and former President Mahinda Rajapaksa. JVP leader Anura Kumara Dissanayake addressing its May Day Rally held at the BRC grounds in Colombo said that it would come as a broad peoples’ force to fill the political vacuum created in the country as the only force which could do that. “The Rajapaksa camp is not a flourishing camp as its power is dependent on Mahinda Rajapaksa and its ideology of obtaining power quickly. They do not have constructive political slogans. They cannot ask for power to develop the economy, ensure democracy, establish good foreign policy or ensure national harmony. They can only say that the LTTE raising its head. But as long as the JVP is in active politics, we would not allow any ethnic conflict in the country,” he said. “Ranil Wickremesinghe also does not have a stable political future as he is not a leader elected by the people but he was a by-product of the 2015 election held between the pro-Mahinda and anti-Mahinda campaign. When people wanted to arrest fraudsters, Ranil was engaged in frauds,” he said. Mr. Dissanayake said the JVP would capitalize on this political vacuum to bring in a peoples’ governance in the country and added that for the last 70 years the governance was not for the people but for the rulers and their henchmen. He said during the 70-year ruling by the UNP and the SLFP, the country had not gone forward but plunged downward and added that the people had become poverty-ridden with lack of proper education and health facilities. He said the government only gave Rs. 100,000 to the Meethotamulla victims as compensation while they spent billions of rupees to purchase vehicles for politicians. Mr. Dissanayake said it would not allow the government to destroy the country anymore and added that they fight for the rights of the people.